FACP has been awarded a grant from the TACA Bowdon Family Foundation Artist Residency Fund in support of the Baumer String Quartet in residence with SMU’s Julius Quartet: a residency that culminates in the May 4 concert that closes our Bancroft Concert season. The award announcement of the 2018 TACA New Works Fund and TACA Bowdon Family Foundation Artist Residency Fund were recapped on TheaterJones. The Dallas Observer featured the Basically Beethoven Festival: Pianos + Percussion concert on its “Best Things to Do in Dallas This Weekend” round-up. D Magazine mentioned the Festival’s July 8 concert, Diversions & Escapes” on their weekly list of “Things to Do in Dallas This Weekend,” too. Our 38th annual Basically Beethoven Festival was highlighted in Scott Cantrell’s write-up in The Dallas Morning News of summer concerts. In May, The Dallas Morning News ran a feature on Dr. Rebecca Glass, viola. Dr. Glass anchors the 12th annual Charles Barr Memorial Concert, which closes the 2017-2018 season of our Bancroft Family Concerts. Dr. Glass appeared on WFAA’s “Midday” for an on-air interview on May 11, 2018. Andrew Anderson’s monthly “Auxiliary Input” column in TheaterJones posted a glowing review of Ted Soluri’s debut CD “Sempre Libera” in advance of his appearance at our Bancroft Family Concert in April. In March, long-time FACP board member and supporter, Donald J. “Don” Stone received the 2018 TACA Silver Cup Award for his philanthropy and advocacy for the arts. WFAA’s “Midday” hosted Colin Davin, guitar, and Emily Levin, harp, to play on-air and discuss their Bancroft Family Concert in November. The musicians also performed at Dallas ISD’s W.E. Greiner Exploratory Arts Academy to showcase their instruments. DISD shared footage of the performance. Harpist (and Bancroft performer) Emily Levin’s CD “Something Borrowed” was reviewed on TheaterJones. D Magazine‘s Christiana Nielson featured the July 23 concert at our Basically Beethoven Festival. D Magazine made sure to mention the opening Basically Beethoven Festival concert in its weekly list of things to do. Basically Beethoven Festival Director Alex McDonald and Assistant Director Lutie Rodriguez appeared on WRR 101.1’s “Classic Cafe” to discuss the Festival. The inaugural scholarships from the Rogene Russell Fund were awarded to composer Quinn Mason and pianist Kenoly Kadia. The Oak Cliff Advocate magazine posted an update on Mr. Kadia, whom they featured in their May issue. VoyageDallas, a beautiful online magazine, interviewed FACP Artistic Director/Co-Founder Rogene Russell and Executive Director Rachel Nelson Assi. Our final Bancroft Family Concert of the season, featuring the Cezanne Quartet, was highlighted on CultureMap Dallas. The Oak Cliff edition of Advocate magazine features high school seniors who have risen “above obstacles to become stars in the class of 2017.” One of the students profiled in May 2017 was FACP scholarship student, Kenoly Kadia, a gifted pianist whose studies with Teaching Artist John Tatum have him on the threshold of selecting a university to continue his music studies. Claire Huangci’s Bancroft concert in April was profiled on CultureMap Dallas. In March, WRR 101.1’s “Classic Cafe” hosted Artistic Director Rogene Russell and Executive Director Rachel Nelson Assi to preview our spring concerts. A list of free Spring Break activities from the Fort Worth Star-Telegram included our remaining Bancroft Family Concerts. CultureMap Dallas reported in January on the 14 arts groups to receive funding from Dallas Arts District Foundation. FACP is proud to be a Foundation grant recipient for over 20 years! Wayne Lee Gay with Theater Jones reviewed the opening performance of our Bancroft Family Concert 2016-2017 season. The “Harps in Harmony” concert featured the Dallas Harp Quartet. WFAA-Channel 8 and reporter Demond Fernandez profiled our piano program at David W. Carter High School during their newscast. Senior piano student Kenoly Kadia, part of our education program at David W. Carter High School was featured as a “Class Act of the Week” on the CW33. Read about the Rogene Russell Scholarship Fund in The Dallas Morning News. The FrontRow blog from D Magazine featured our 36th annual Basically Beethoven Festival online. 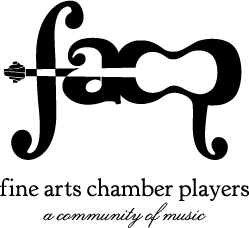 Click here to read about Fine Arts Chamber Players’ educational outreach efforts. Composition student Quinn Mason recently received a prestigious music award. Looking for an archived version of one of our newsletters? Click here.